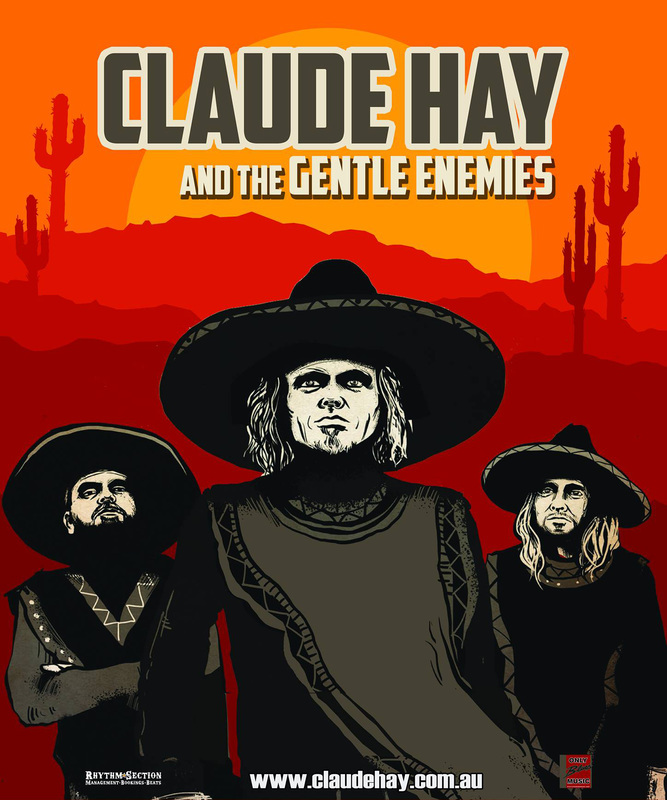 Roots rock artist Claude Hay is known around the world as a leading exponent of live looping - technology allowing him to create the sound of a live band whilst playing solo. Claude has taken a surprising next step and joined forces with actual live breathing musicians to release the double A-side single Borracho/Run this April under the moniker of Claude Hay and The Gentle Enemies. Weighing in somewhere exactly between C. W. Stoneking and Queens of The Stone Age, Claude’s new tracks come from different sides of the spectrum. The song Borracho is classic Claude Hay and chugs along with fuzzy funk intensity as it relates a common tale of over- indulgence. Run is quite a different beast and would likely never have seen the light of day without a full band behind it. Run is a protest song aimed squarely at one of the most hated politicians in Australian history and Hay grinds the axe with one of the best rock and roll screams since Chris Cornell. A couple of extra seats have been installed in the campervan and the new three-piece is piling in for an east coast launch tour that takes in Bluesfest in Byron Bay, The Blues on Broadbeach Festival and a bunch of shows in between including The Netherlands where Claude will be back in his solo guise to launch his last album and a new live DVD on the unsuspecting Dutch. The Borracho tour runs from late March through to the start of June. The Gentle Enemies features Ryan Van Gennip and Jon Howell, a rhythm section team who have worked closely together in various groups including with Chase The Sun, Marshall Okell and Cass Eager, as well as having performed individually with Leonardo’s Bride, Diana Anaid, iOTA, Charlton Hill, Jimmy Little and many others. Claude Hay has released three solo albums over a solo career spanning seven years, his albums have charted on the US Billboard and Amazon charts and he’s won Chain and MusicOz awards locally. Claude has performed at every major blues and roots festival in Australia, and tours Europe and The US each year. Fri 16th May - Dickson, Oneill’s Pub (solo show) - free entry! Fri 30th May - Newcastle, the Stag and Hunter Hotel - free entry! Sat 1st Jun - Towradgi, the Towradgi Beach Hotel - free show!